Prior to seeing Bohemian Rhapsody, I knew precious little about the rock group Queen. Sure, I’d enjoyed lots of their pop hits like “Crazy Little Thing Called Love” and “Another One Bites the Dust,” but I was totally unaware of the legendary British band’s back story. 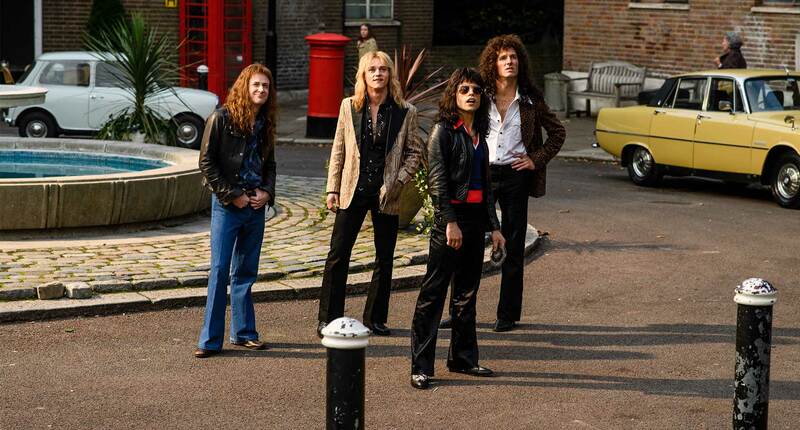 It was founded in the early seventies by guitarist Brian May (Gwilym Lee), drummer Roger Taylor (Ben Hardy), bassist John Deacon (Joseph Mazzallo), and lead singer Farrokh Bulsara, aka Freddie Mercury (Rami Malek). The film fittingly revolves around the flamboyant front man with a four-octave vocal range who also came up with the suggestive name Queen. Born in Zanzibar and of Persian descent, Freddie’s family fled to England when he was 17 to escape ethnic cleansing. In London, he met Mary Austin (Lucy Boynton), the woman he would forever consider the love of his life, despite the fact that he was homosexual. For years, she would serve as the rock Freddie returned to whenever Queen came off the road, until he finally confessed to being gay. Out of the closet, he was suddenly free to engage in the sort of risky sexual behavior that could catch up with you at the inception of the AIDS epidemic. Meanwhile, Queen continued to crank out such rock ‘n’ roll anthems as “We Will Rock You” and “We Are the Champions.” Eventually, an ailing Freddie would abandon his band mates for a solo career that failed to take off. All of the above is recounted in fascinating fashion in Bohemian Rhapsody, a riveting rocktrospective directed by Bryan Singer (The Usual Suspects). Whether recreating the group’s concert performances or offering a peek at their offstage antics, it’s always the irrepressible Freddie who’s front and center. Rami Malek delivers an unforgettable performance in a breakout role destined to be remembered come awards season.